A classic design is given Bell & Ross' round and bold aesthetic, with a stainless steel case, sharp hands and accents in the black dial for extra precision, a date aperture to help with timekeeping, and a unidirectional bezel that can be rotated for precise timings. The watch features automatic movement and is water resistant for up to 100 metres. Made with Swiss expertise. 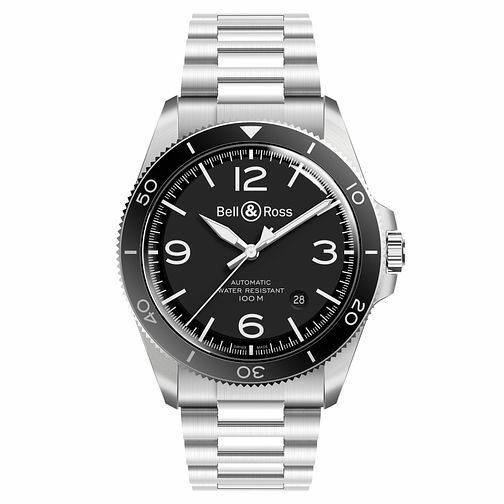 Bell & Ross BRV2 Men's Black Stainless Steel Bracelet Watch is rated 5.0 out of 5 by 1. Rated 5 out of 5 by Anonymous from Brilliant design for a vintage feel This watch is just beautiful. I had been looking at watches like the Tudor Black Bay, but the design of the Bell and Ross is just more to my taste. The details are stunning gin the flesh. The domed sapphire crystal, second hand, dial design and bezel are the highlights. One note is that the bracelet is very hard to remove, but this watch looks great on a variety of straps, so it's worth the effort.